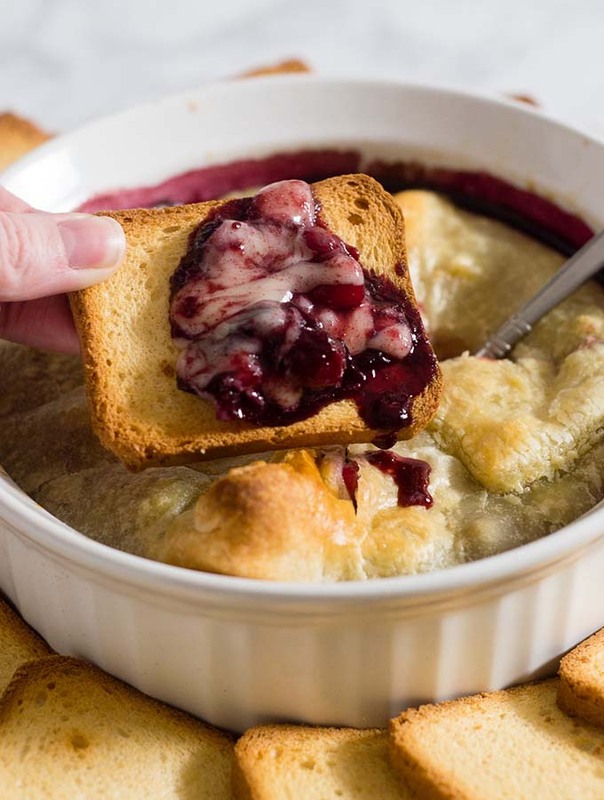 Baked brie en croute is a luxurious appetizer, and this one goes the extra mile with a flavorful cabernet cranberry cherry sauce. Welcome to another edition of Progressive Eats, our virtual version of a progressive dinner party where each course is held at a different home. With Progressive Eats, a theme is chosen each month, members share recipes suitable for a delicious meal or party, and you can hop from blog to blog to check them out. This month’s theme is a New Year’s Eve Extravaganza hosted by Jane of The Heritage Cook. Enjoy these jaw-dropping recipes, ideal for any special occasion and the perfect way to ring in the New Year! 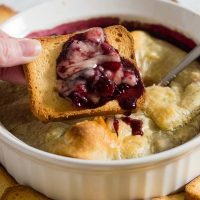 Today, I’m sharing an appetizer that I’ve been making for the past three or four years: baked brie with cabernet cranberry cherry sauce. I make it at Thanksgiving, Christmas, and New Year’s because it’s just so delicious. It’s no big surprise that I love an appetizer built on a big wheel of gooey, melty cheese. It’s then topped with a fancy cranberry sauce flavored with red wine and cherries, then wrapped in puff pastry. The cranberry sauce is so delicious that I make a double or even triple batch, and use the extra to spread on top of pork tenderloin, on toast, or over ice cream. The freezes well, so make as big a batch as you like! 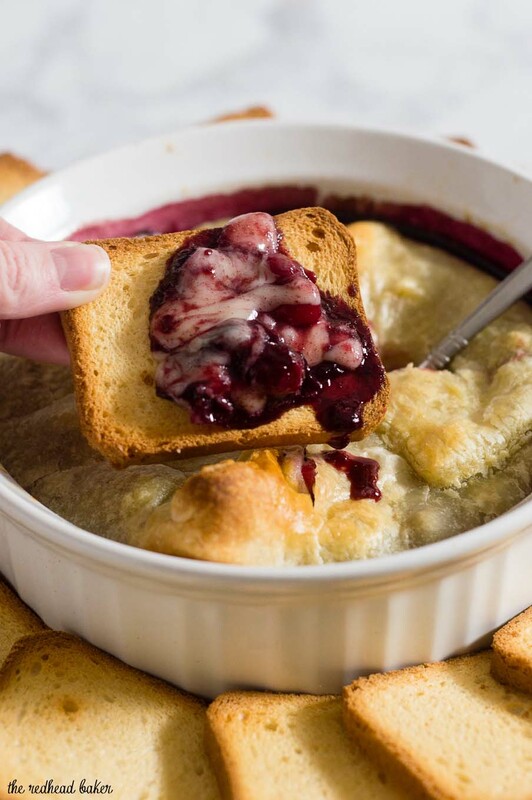 I prefer serving this baked brie with brioche toasts from Trader Joe’s, but toasted baguette slices, water crackers, or crostini would also work well. 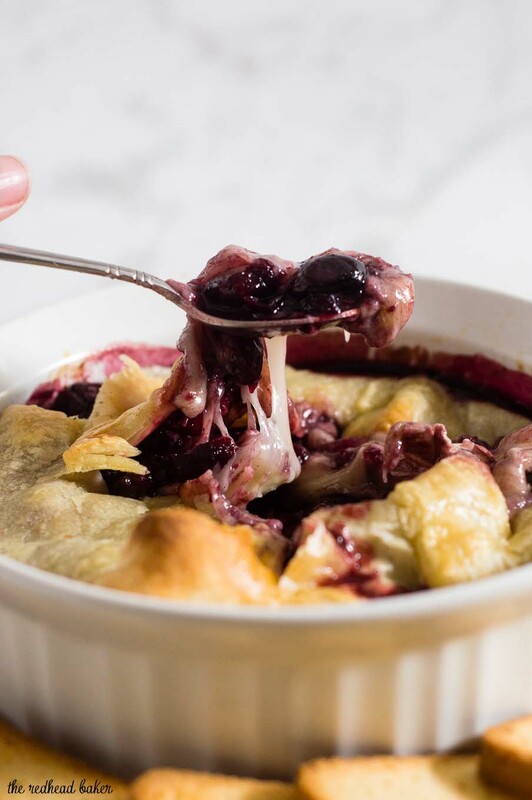 Place the wine, cherries, cranberries, sugar, and zest in a medium saucepan, and bring to a simmer over medium heat, stirring until sugar has dissolved. Lower the heat and continue to simmer, uncovered, stirring occasionally, until cranberries burst and mixture has thickened slightly, 10 to 15 minutes. Remove from heat and cool completely. Sauce can be made up to a week ahead and stored in an airtight container in the refrigerator. Lay the sheet of puff pastry on a clean, lightly floured surface and roll out slightly. Lay it in an 8-inch round ceramic baking dish. Cut the wheel of brie in half horizontally. Spoon 1 cup of the cranberry sauce onto the cheese and spread in an even layer. Top with the second half of the cheese, and spoon the rest of the cranberry sauce on top. Fold the corners of the puff pastry over the brie and cranberry sauce, gently stretching if necessary. Pinch the corners together to seal. Beat the egg with the water and brush a thin layer on top of the puff pastry. Place the ceramic baking dish on a baking sheet, and place the baking sheet in the oven. Bake for 25 to 35 minutes, until the puff pastry is fully baked and golden brown. 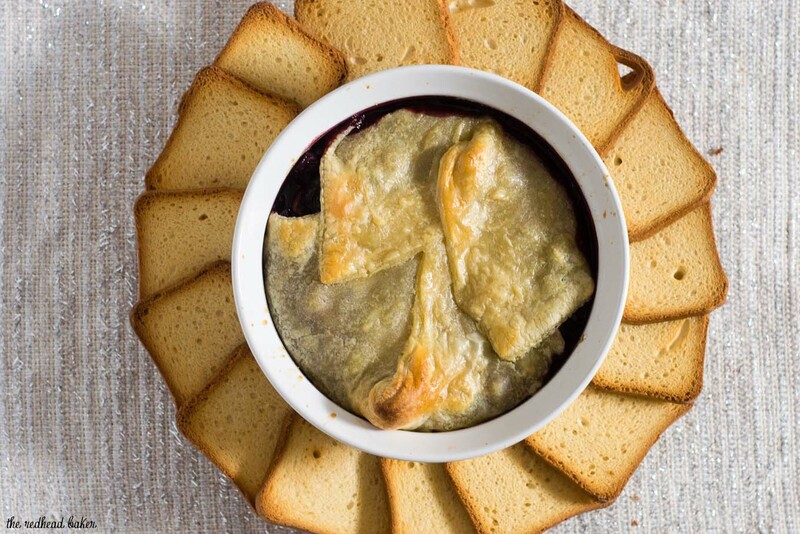 Cool the baked brie slightly, then serve with brioche toasts or other crackers. We have a core group of 12 bloggers, but we are always looking for substitutes. To see our upcoming themes and how you can participate, please check out the schedule at Creative Culinary or contact Barb directly for more information. Oh, how I love a good baked brie! 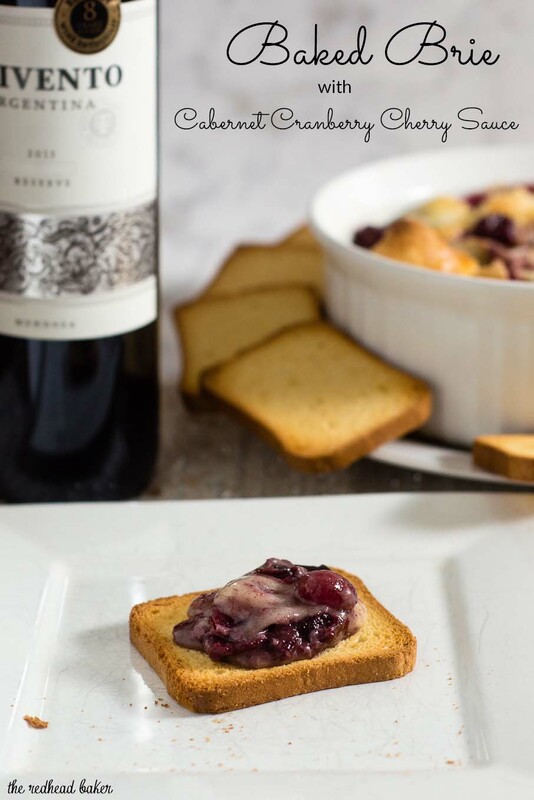 Your cab cranberry cherry sauce sounds like a perfect pairing with the creamy brie. I can see why you make this one again and again!! 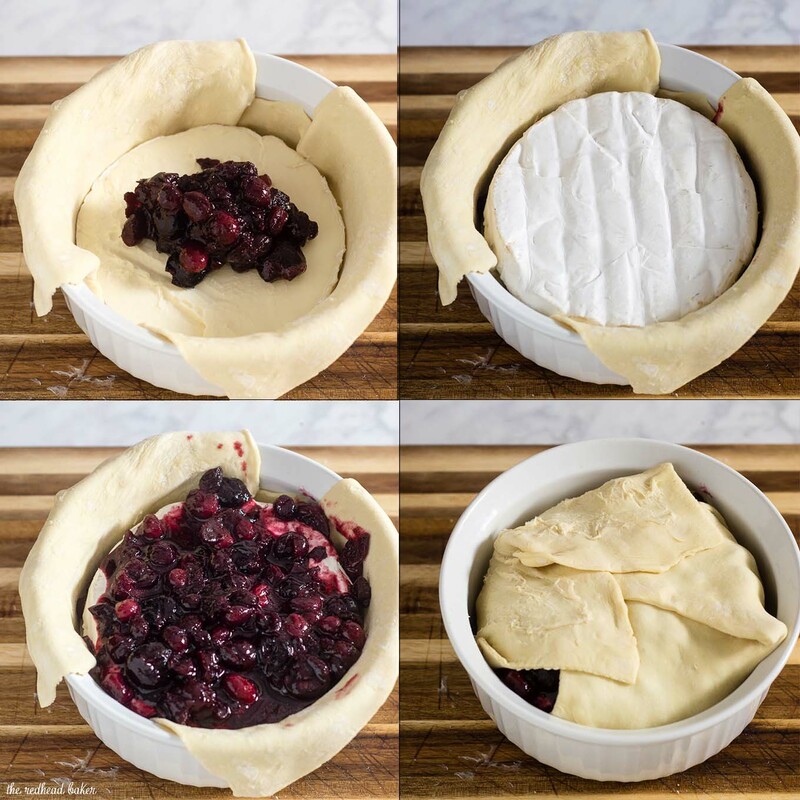 I adore baked brie, but never thought to bake it in a container – so smart! And your cranberry-cherry sauce sounds similar to one I love to use with smoked duck. I know The Artist and I would LOVE to have this for any holiday meal!! Such a great way to kick off our New Year’s Eve Extravaganza for #ProgressiveEats!! Oh my gosh, this would totally be my favorite appetizer! How perfect for a holiday party to get everyone in a festive mood. Saving this one!!! This is totally my kind of appetizer! Love it, Coleen! You had me at the cabernet! I just put brie out “naked”, but no more. This recipe is a must try for my next party. I might just eat that sauce by the spoonfuls and then some!! Love the whole flavour combo with brie and the puff pastry ! Great idea!